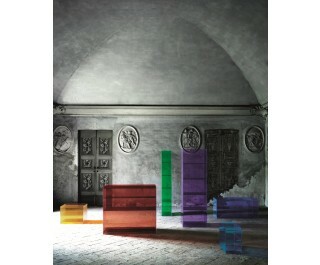 Series of open storage furniture in laminated 5 + 5 mm. thick shiny ground and thermo-welded glass. Available in two different versions. The first version is in transparent extralight glass, transparent coloured glass or matt coloured diffusor glass. It is also available in a second version with coated finish, where it is possible to freely combine the colour of the interior and of the exterior , choosing from glossy lacquered or opaque lacquered.